From classic cocktail lessons to gimmick-free accessories. Find anything suitable for your friends and family here. We are promoting a handmade and skill based Christmas this year! Sick of those Advent Calenders, where the opening of those little doors will feature a festive extravaganza of slightly stale chocolate animals? Yea so are we, we’d much rather count down to Christmas with rooibos and assam. Learn how to make this clever little tea advent calender with The Tea Republic Founder Sumita to give as pre christmas gifts to delight your friends and family. Register at www.culturerun.com, Dec 1st 2012 3-5pm. As much as coffee has taken KL city by storm, we still think most KL-ites still have a soft spot for a nice cup of tea. This Christmas season learn how to create a personalised christmas tea blend to spend those rainy days indoors sipping away at, or give them away to friends and family to enjoy with your personalised stamp on it of course. This ShareShop will include all packaging for your personalised blend. Dec 1st 1130am-1pm. The festive season will be in full swing, the parties will be coming in thick-and-fast, so there’s a good chance you’ll be hosting one. Learn how to make cocktails that will loosen up the frostiest of crowds or even just to ease your festive season stress. We guarantee you that at least numerous times over the festive season you’ll need a good drink to de-stress. Dec 2nd 2012 3pm-5pm. Learn how to bind your own book! Moleskine’s don’t hold a candle to a solid book bound with your own two hands. In this ShareShop learn how to make a wonderfully personalised gift that is suitable for anyone. Gift it as a journal, sketchbook, album or fancy notebook. Or keep it for yourself, so when 2013 rolls around you have a beautiful hand bound book to fill with your thoughts, photos or to-do lists. Handmade and personalised, it’s sure to be a keepsake gift for years to come. Dec 1st 1030am-130pm. 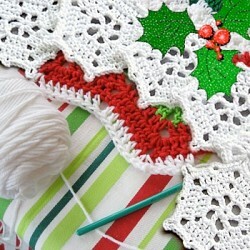 Learn to create crocheted Christmas ornaments! Why not be unique this Christmas and make your own hand crafted ornaments to give as gifts? Crocheted snowflakes, wreaths, and baubles would make adorable decorations on your tree this holiday season that will make your friends go ‘ooh’ and ‘ahh’, and even, ‘make one for me!’ In this ShareShop, you will learn the basic knitting techniques to get you started on making an array of crocheted ornaments. Just bring your own yarn. Dec 9th 3pm-5pm. Encourage your kids to learn how to bead their own jewelry in this fun ShareShop specially designed for them. They will experience handling the tools of jewelry making and also creating their own unique necklaces or bracelets to give to their friends and family. This two-part ShareShop series (Part 1 & Part 2) provides all the materials that are safe and easy to use. Your kids will be supervised so you could enjoy a little alone time! Dec 15th 330pm-5pm. Light up your Christmas with your very own hand made Christmas lights! Fairy lights are a thing of the past. Start a new tradition by making your own sun jar that lights up by itself when it gets dark! This solar-powered lighting device made from household items will beautifully decorate your garden and walkways and makes an environmentally friendly gift for a friend or loved one. In this ShareShop, you will not only be provided with materials but also learn other ways of utilising of your sun jar! Dec 2nd 4pm-6pm. Dance away this holiday season! What good is a holiday party without music and what way best to take advantage of that music than dancing! Ladies, bring a girlfriend along and learn how to move like a Gatsby Girl to Charleston music. In this ShareShop, you will learn a truly American popular vintage dance that will sure fancy up that dress-up party even more with cutesy and crazy moves. Dec 9th 430pm-6pm.